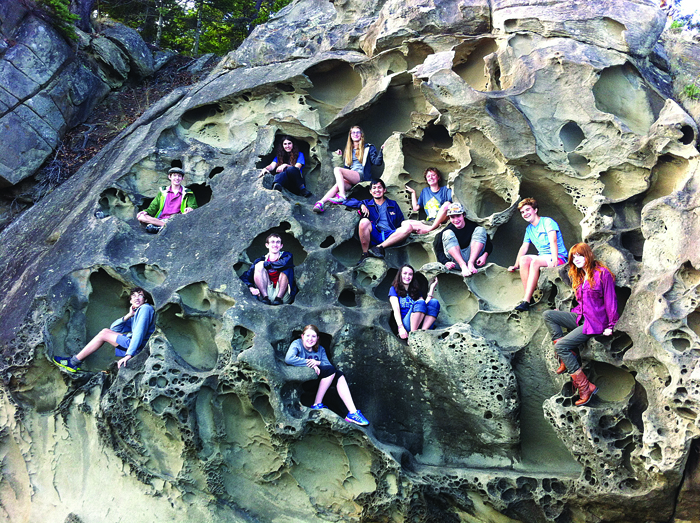 A SEEC cohort from 2014 has their class photo taken amid sandstone. Gulf Islands School District’s Saturna Ecological Education Centre (SEEC) has received a grant to purchase a set of environmental sensors that students will use to build their ecological and technological literacy skills. The $10,000 grant from Vancity will be used to purchase the various sensors as well as some interfaces to help record and process data. The new sensors are expected to be delivered shortly after the start of the school year. Martin Anevich, the teacher at SEEC, hopes that the sensors will help students become more familiar with the tools used by real researchers in the field. Saturna Island offers unique opportunities for science and research, Anevich explained. Rather than having students sit in a classroom and finish textbook labs with predictable outcomes, he is looking to partner with some researchers and organizations to get the students into the field and contributing real data to national research projects. The three-hour hike to the research site to collect samples is as important as the results. SEEC was started in 2007 by Steve Dunsmuir, a teacher who at the time was based on Saturna. The course is a boarding program offered to students in grades 10 and 11. Students stay in cabins at Haggis Hollow on the island for three nights every week. The cabins are off-grid and eco-friendly, powered by solar panels and micro-hydro power. Students are expected to cook for themselves and to take care of the cabins. With learning opportunities taking place all over Saturna, the students do not spend their whole day in a classroom. The school still focuses on outdoor education and skills like kayaking and fly fishing, but with some real-world scientific literacy as well. The students still follow the B.C. curriculum and their year at SEEC has a full 32 credits that count toward graduation. Students get two science courses, two physical education courses, social studies, two English courses and Careers 10. Anevich, who is starting his second year at SEEC, hopes that the new sensors help make it more than just an outdoor education program. He wants SEEC to stay “cutting edge” and allow the students to be on the forefront of education. The school is open to any student in School District 64 who is in Grade 10 or 11. One spot is still available at SEEC for the 2018/2019 school year. Students interested in applying this year can do so at http://seecsaturna.ca/apply/.